The domain of a function is the set of possible values for the variable. The range would be the possible values for the solution, . The value inside of a square root must be greater than or equal to zero in order to have a real solution. Now we can solve for in the inequality. Square roots have positive and negative roots, so we need to set up two results. Remember to switch the direction fo the inequality for the negative solution. These solutions can be combined to give our final answer. Any values of that are not included will result in an imaginary (impossible) answer. Which of the following does NOT belong to the domain of the function ? The domain of a function includes all of the values of x for which f(x) is real and defined. In other words, if we put a value of x into the function, and we get a result that isn't real or is undefined, then that value won't be in the domain. If we let x = 0, then we will be forced to evaluate , which is equal to 1/0. The value of 1/0 is not defined, because we can never have zero in a denominator. Thus , because f(0) isn't defined, 0 cannot be in the domain of f(x). What is the range of ? The range of a function is all of the possible values that the equation can take. For this equation our value cannot be negative, as a negative number squared still gives us a positive value. Since , we know that the lowest possible value that can reach is . Therefore the range is . Find the domain of the following function. All real numbers such that . All real numbers except . Domain represents all possible values for . In this situation, we want to make sure that the numbers under the square root are greater than or equal to 0. This will be the case when . Thus, the domain includes all real numbers such that . The range of a function is defined as the possible values for , or the possible outcomes. In this function, it is not possible to get any sort of negative number as an outcome. It is possible to get zero when . Thus, the range is all real numbers greater than or equal to 0.
is a sine curve. What are the domain and range of this function? The domain includes the values that go into a function (the x-values) and the range are the values that come out (the or y-values). A sine curve represent a wave the repeats at a regular frequency. Based upon this graph, the maximum is equal to 1, while the minimum is equal to –1. The x-values span all real numbers, as there is no limit to the input fo a sine function. The domain of the function is all real numbers and the range is . If , which of these values of is NOT in the domain of this equation? Using as the input ( ) value for this equation generates an output ( ) value that contradicts the stated condition of . Which analysis can be performed to determine if an equation is a function? The vertical line test can be used to determine if an equation is a function. In order to be a function, there must only be one (or ) value for each value of . The vertical line test determines how many (or ) values are present for each value of . 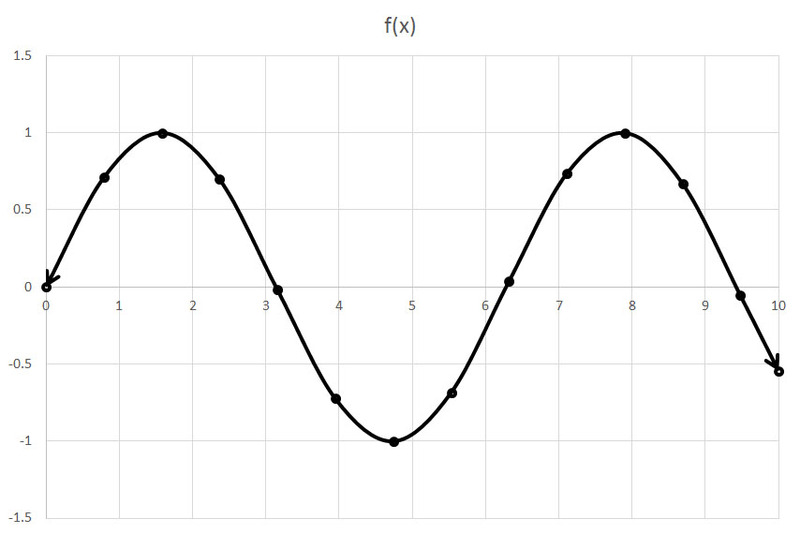 If a single vertical line passes through the graph of an equation more than once, it is not a function. If it passes through exactly once or not at all, then the equation is a function. The horizontal line test can be used to determine if a function is one-to-one, that is, if only one value exists for each (or ) value. Calculating zeroes, domain, and range can be useful for graphing an equation, but they do not tell if it is a function. Let and . What is ? THe notation is a composite function, which means we put the inside function g(x) into the outside function f(x). Essentially, we look at the original expression for f(x) and replace each x with the value of g(x). The original expression for f(x) is . We will take each x and substitute in the value of g(x), which is 2x-1. We will now distribute the -2 to the 2x - 1. We must FOIL the term, because . Now we collect like terms. Combine the terms with just an x. College of William and Mary, Bachelor of Science, Neuroscience. Georgetown University, Master of Science, Physiology. University of Minnesota-Twin Cities, Bachelor of Science, Chemical Engineering.